Why - - A Hospital Chaplain? Pastoral Ministry in a hospital setting is Holy Work on a sacred ground, although it often feels like a desert wilderness. Health Care is about tending to people who are vulnerable, fragile and in pain. Their suffering takes many forms: physical pain, frustrated hopes, anxiety, depression, loneliness, isolation, grief and spiritual crisis. And though suffering occurs in everyone’s life, it intensifies when someone is hospitalized. As a hospital chaplain, I am called into the midst of suffering. I cannot remove the suffering, but I can help people find the meaning of their pain and seek to move through it. I am called to meet patients and loved ones in distress. I seek to comfort, sustain, engage, discern, and respond. My role as a chaplain is to proclaim the good news that we are not alone. The good news may be difficult to hear, because often patients and their loved ones feel captive by disease and brokenness. As a chaplain I am one of the few members of the healing team whose role is to reach out and see patients as people not as problem to be solved. Reminding patients of their worth and dignity, that they are more than their disease and broken body, can be liberating to patients and their families. While I can’t answer the question of why people suffer, I work to listen for the answer patients may bring. My role is not to push my beliefs on others but to help them discover their own beliefs. I understand the ministry of a chaplain as fulfilling several roles. I am a spiritual companion, joining patients and their families on their journey in the hospital, listening to who they are and discerning how the spirit of God may be working in their lives. The hospital chaplain is also a priest and liturgist, administering the Sacrament upon request and providing opportunities for worship, spiritual reflection, and celebration. Being and advocate for patients is another function one that may include speaking up when they have no one to speak for them regarding end of life decision and overall patient care. I participate in ethics consultations with other hospital staff, and I am a regular participant in the interdisciplinary rounds on my units I am also a voice for justice and mercy concerning health care issues. In this age of managed care and for-profit hospitals, those oppressed by these systems need someone to speak for them. As a hospital chaplain, I am an educator. In this capacity, I work to help all the hospital staff understand pastoral care. More specifically, I work to help staff understand the spiritual dimension of illness, suffering and death. Teaching occurs during end of life conferences with residents and house staff through regular participation in rounds, and in special conferences for nurses. While fulfilling these roles is important, I do believe that my chief role is to provide and help shape hospitality within the hospital. Not everyone needs or wants a chaplain. However, because we are all human, most of us need or at least appreciate some interest shown towards us. My ministry of acceptance and care for the personhood of the other is vital, since hospitals can be lonely, alienating places where there are more strangers than friends. My prayer is to be an agent of hospitality to all I meet so that there is a “free space where the stranger can enter and become a friend instead of an enemy. Author: Rev. 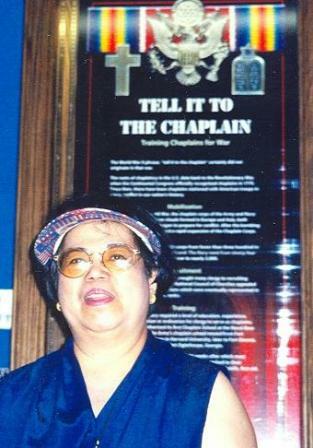 Dorothy Caldwell, Hospital Chaplain, Sisters of Charity Medical Center, St Vincent Campus, Staten Island, New York but now a Pastor at New Platz United Methodist Church, New Platz, New York.